On paper, the Tesla Model X P100D has the makings of a performance car. The SUV is equipped with 14-inch ventilated brakes and the electric equivalent of 762 horsepower. Acceleration from zero to 60 mph is 2.9 seconds. Yet despite an enviable set of performance metrics, this is a seven-seat people hauler with a hint of the current jelly bean crossover styling. Perhaps a better classification would be as the most capable electric vehicle on the market. 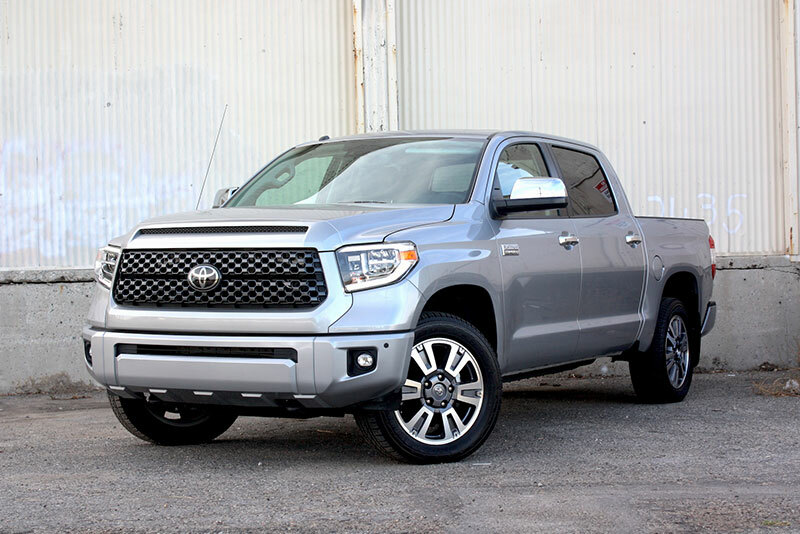 It has advanced safety features, room for a large family and pets and a towing capacity of up to 5,000 pounds, enough to pull a small Airstream. It’s also a stylish luxury SUV that matches up well against the offerings from BMW, Lexus and Range Rover. But like a television infomercial, “there’s more.” The top version of the Model X fits in with the growing generation of steroidal SUVs. It’s like the Porsche Cayenne Turbo and Jeep Grand Cherokee Trackhawk, vehicles that emphasize lap times as much as comfort and storage capacity. The Tesla Model X P100D —the P stands for “Performance” — is the first electric member of that exclusive club. A 135-mile route through the San Gabriel Mountains just north of Los Angeles, allowed the Model X to display all of its attributes. The drive’s sharp twists demand good balance and handling. Steep grades require torque and braking. Range is a necessity to climb 7,900 feet of elevation and back down to a charging station. With a 4-year-old child snapped snug in her car seat, safety was also a priority. The trip started with the vehicle’s 17-inch touchscreen reading 221 miles of electric range. Pointed north, the Model X breezed along the highway toward the mountains. Adaptive cruise control proved helpful in this setting. A small stalk on the left side of the steering wheel launched the automated feature. The SUV’s computers and sensors track the car directly in front. If traffic slowed, the Model X matched the pace, even coming to a full stop and starting again. It quickly felt normal to lay off the brakes in traffic. The Tesla virtual driver ably accelerates as traffic opens back up. Tesla’s controversial Enhanced Autopilot system is more complicated. Critics of the name are correct. This is a driving aide. Both Tesla’s instructions, and my own personal experience, quickly proved that the driver needs to stay engaged at all times. The automated feature, a $5,000 option, used cameras and radar to read road markings and keep the Model X in its lane. There is a setting to direct Autopilot to remain at or near the speed limit. It can steer around curves and change lanes. Although the technology exists, Tesla has not cleared the program to stop for red lights and stop signs. Autopilot requires drivers to keep contact with the wheel or it will issue a beeping alert and eventually deactivate. Oddly, once you get used to the features, it takes willpower to keep your hands on the wheel when they aren’t needed. Smartphones make for alluring distractions. Of course, Tesla and other automakers don’t want customers to use automated features as an excuse for distracted driving. Tasks such as merging lanes or carefully navigating construction zones are best left to the driver. Tesla has maintained that Autopilot is designed for well-marked lanes and the driver should always be prepared to take over manually. 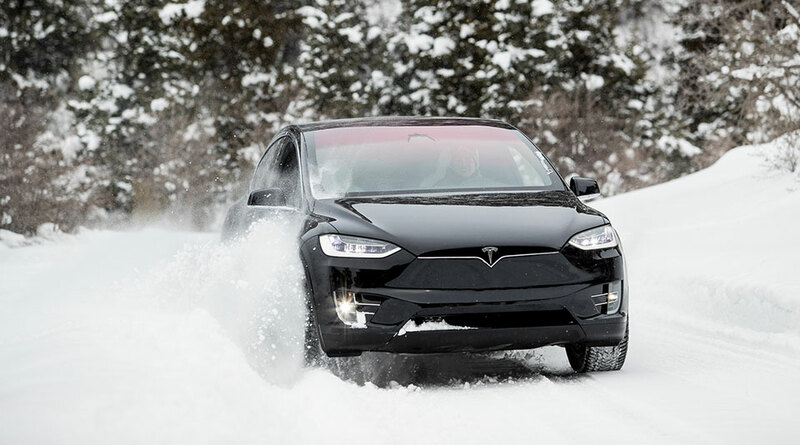 More than once the Model X didn’t react to conditions that the driver can easily spot and execute. The bottom line: Autopilot works best when treated as a driving-assist tool — not a self-driving mode. 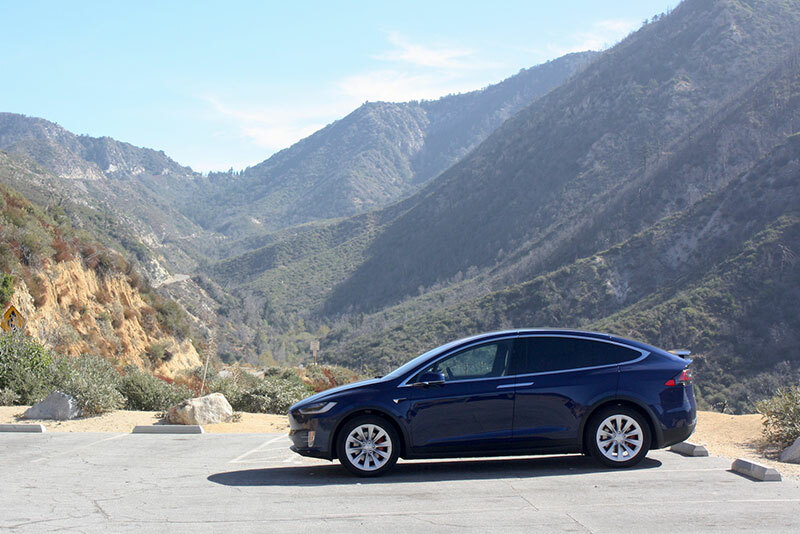 Our test route led to the top of Southern California’s mountainous Angeles Crest Highway. At scenic stops along the way, the “Falcon Wing” rear doors opened vertically to reveal dramatic views of the wilderness for miles around. Many owners have documented struggles with the complicated doors malfunctioning. On this ride they were a delight. The only issue: the button to open them is within reach of the average 4-year old’s big toe. Model X trims begin with the 75D. The “slowest” of the Model X bunch, its zero-to-60 acceleration takes just 4.9 seconds. Pricing starts at $79,500. The faster 100D trim comes with the largest available 100-kilowatt-hour battery pack and costs $96,000. All models come with dual motors, one powering the front axle and one powering the back, for all-wheel drive. The P100D trim sits at the top of the line. It is priced from $145,000. The model tested along Angeles Crest Highway was optioned up to exceed $162,000. The P100D comes with the Ludicrous Speed Upgrade, which unlocks maximum power. Its output of 568 kilowatts is roughly equivalent to 762 horsepower — more than the visceral Trackhawk. Slam the accelerator and the SUV thrusts passengers into their seats like a Space Shuttle launch. “Make it go super-fast again!” said the passenger from the back row. Through the mountains the ride was quiet, the chassis stayed flat and the floor-mounted battery pack lowered the center of gravity. 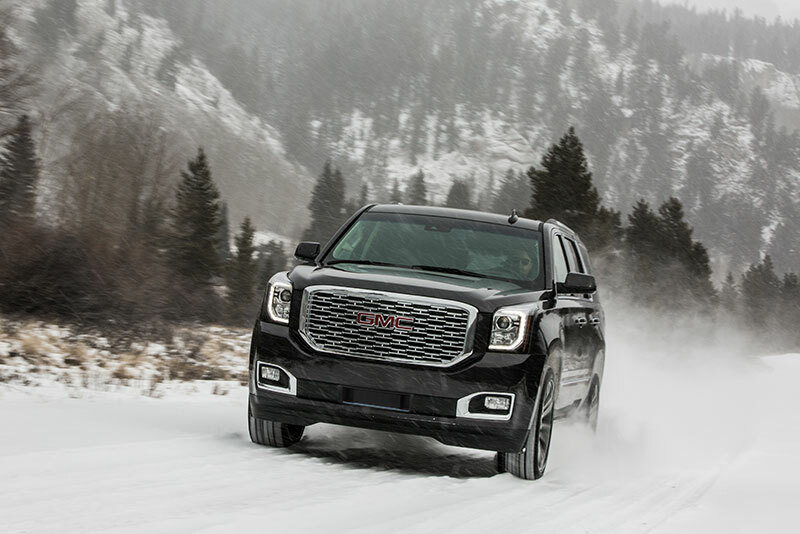 The dual motors and performance tires provided excellent traction. The P100D moved effortlessly through mile after mile of pristine California wilderness. The Model X has excellent acceleration and precise handling, but its ease at speed dulls the spirited nature of driving a fast, dynamic car. In 1829, the philosopher Thomas Carlyle warned that the Industrial Age would change mankind for the worse. “Nothing is left to be accomplished by old natural methods,” Carlyle said. His words could apply to the changing tides the Model X P100D presents to performance vehicles today. The electronic steering is accurate but not very communicative. It doesn’t provide the firm feedback from the road that one would expect in a top-level performance vehicle. The one-speed transmission eliminates the need to shift gears or even account for engine rpm at all. Full torque is available at all times. I felt far less engaged. The Tesla Model X and advanced-technology vehicles like it represent where automobiles are headed. But it’s unclear if they are the future of performance cars. There is a sense of driver involvement in traditional sports cars that the Porsche Cayenne Turbo and Jeep Grand Cherokee Trackhawk imitate, if not completely replicate. The Tesla Model X makes no such promises. Its drive is fast and efficient at the expense of being challenging and rewarding. Although the P100D zoomed around corners and clipped apex after apex easily, driving became a blur as the contours of the road blended together. It was difficult to recall memorable moments. Traditionally, performance vehicles go fast because driving fast is fun. The Model X P100D goes fast because it can. Still, the Model X is undeniably fast, luxurious and capable of providing hundreds of miles of electric driving experience. It scythed down the mountain and used regenerative braking to partially restore the battery energy it used going up. It reached the nearest Tesla Supercharger station in Rancho Cucamonga, Calif., with 60 miles of range to spare. After 30 minutes of charging at a 220-volt plug, the range shot up to 191 miles. It had been a long day of driving and the sun began to set. The Model X headed for home. Then the order came from the back seat. Good read. I hope the electrics never fully replace or make muscle cars obsolete. Some of us enjoy the “driving experience” and not just the 0 to 60 split. Some of us want the sound and the look of pure muscle. Keep my speed loving granddaughter safe and sound! Supercharger is 400V or 350V (for older, smaller batteries). > (wikipedia) In the United States and Canada, national standards specify that the nominal voltage at the source should be 120 V and allow a range of 114 V to 126 V (RMS) (-5% to +5%).